Cardiovascular diseases are disease of the heart and blood vessel system. They include coronary heart disease (often called heart disease), stroke, high blood pressure, angina and rheumatic heart disease. According to the CDC, heart disease is the leading cause of death in the US, with 500,000 people in the United States dying of heart disease each year. Many others with heart problems become permanently disabled. Heart disease occurs when the arteries that supply blood to the heart muscle become hardened and narrowed, due to a buildup of plaque on the arteries’ inner walls. Plaque is the accumulation of fat, cholesterol, and other substances. As plaque continues to build up in the arteries, blood flow to the heart is reduced. This prevents oxygen and nutrients from getting to the heart. Heart disease can lead to a heart attack. A heart attack happens when a cholesterol-rich plaque bursts and releases its contents into the bloodstream. This causes a blood clot to form over the plaque, totally blocking blood flow through the artery. A heart attack can cause permanent damage to the heart muscle. Some people aren’t too concerned about heart disease because they think it can be cured with surgery. This is a myth. Heart disease is a lifelong condition. Surgery can help blood and oxygen flow more easily to the heart but the underlying issues that caused the issue in the first place must be removed or controlled or else the condition will simply return. Risk factors are conditions or habits that make a person more likely to develop a disease. They can also increase the chances that an existing disease will get worse. Certain risk factors for heart disease, such as getting older or having a family history of early heart disease can’t be changed. The good news, however, is that there are many risk factors that you have control over with personal choices and lifestyle habits. Smoking. People who smoke are up to six times more likely to suffer a heart attack than nonsmokers, and the risk increases with the number of cigarettes smoked each day. Quitting will greatly reduce your risk. High Blood Pressure. Also known as hypertension, high blood pressure increases your risk of heart disease, stroke, kidney disease, and congestive heart failure. Blood pressure often can be entirely controlled by getting regular physical activity, losing excess weight, cutting down on alcohol, and changing eating habits, such as using less salt and other forms of sodium. Please see Chapter 4 for detailed information on exercise and controlling blood pressure. High Blood Cholesterol. High blood cholesterol can lead to the buildup of plaque in your arteries, which raises the risk of a heart attack. Starting at age 20, everyone should have their cholesterol levels checked by means of a blood test called a “lipoprotein profile.” You can lower high blood cholesterol by getting regular physical activity, eating less saturated fat and trans fat, and managing your weight. Artificial trans fats. Also referred to as trans fatty acids, trans fats are created in an industrial process that adds hydrogen to liquid vegetable oils to make them more solid. We consume trans fats in most processed foods where the label reads, “partially hydrogenated oils.” Used in most packaged foods because it is cheap, trans fats raise your bad (LDL) cholesterol levels and lower your good (HDL) cholesterol levels. Eating trans fats increases your risk of developing heart disease and stroke. It’s also associated with a higher risk of developing type 2 diabetes. By limiting or eliminating your consumption of trans fats you will greatly reduce your risk of developing heart disease. Overweight. If you are overweight or obese, you are more likely to develop heart disease even if you have no other risk factors. The good news: Losing just 5-10 percent of your current weight will help to lower your risk of heart disease and many other medical disorders. Please refer to Chapter 2 for more information on exercise and weight loss. Diabetes. Being a diabetic greatly increases your risk for heart disease, stroke, and other serious diseases. Many people at high risk for diabetes can prevent or delay the disease by reducing calories as part of a healthy eating plan, and by becoming more physically active. Please refer to Chapter 3 for detailed information on exercise and diabetes. Physical inactivity. According to the U.S. Surgeon General’s Report on Physical Activity and Health, inactive people are nearly twice as likely to develop heart disease as those who are more active. This is true even if you have no other conditions or habits that increase your risk for heart disease. Lack of physical activity also leads to more visits to the doctor, more hospitalizations, and more use of medicines for a variety of illnesses. Every risk factor counts. Research shows that each individual risk factor greatly increases the chances of developing heart disease and having a heart attack. A damaged heart can damage your life, by interfering with enjoyable activities and even keeping you from doing simple things, such as taking a walk or climbing steps. Getting regular physical activity is an especially important part of your healthy heart program, because physical activity both directly reduces your heart disease risk and reduces your chances of developing other risk factors for heart disease. For example, regular physical activity may reduce LDL (bad) cholesterol, increase HDL (good) cholesterol, and lower high blood pressure. It can also protect your heart by helping to prevent and control diabetes. Finally, physical activity can help you to lose excess weight or stay at your desirable weight, which will also help to lower your other risks. Physical activity can protect your heart in a number of important ways. Best of all, to get benefits, you don’t have to run a marathon. Regular activity—something as simple as a brisk, 30-minute walk each day—can help you to reduce your risk of heart disease. For people with heart disease, it is important to take some common sense precautions with your exercise program. Get clearance from your doctor before beginning any exercise program. Knowing your base line numbers is also a good idea so your doctor can more easily measure your improvements. Try to engage in no or low impact activities such as walking, bicycles, elliptical machines, etc. A certain amount of stiffness is normal at first. But if you do hurt a joint or pull a muscle, stop the activity for several days to avoid more serious injury. Start your activity program gradually, and work up slowly. Be sure to warm up, cool down, and stretch each and every time you are physically active. Use proper footwear, ensuing you have good quality sneakers with adequate cushioning and support. If you are exercising outdoors, be sure to wear proper gear and always face on-coming traffic. 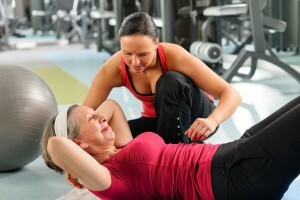 Exercise with a friend to make it more enjoyable and to have someone with you in case of any emergency. Drink adequate fluids—particularly water—before, during, and after your physical activity. Although it is important for everyone, staying within the proper heart rate when exercising is really important for people with any type of heart condition. When you exercise your heart beats more vigorously. By monitoring a person’s heart rate (also called pulse), the level of intensity can be adjusted to ensure they stay within what is called a “target heart zone.” This simply means the rate that is best for that particular person. This is generally calculated by a percentage of maximum heart rate, which is the maximum number of beats per minute that is considered healthy for a particular individual based on their age and physical condition. For moderate-intensity physical activity, a person’s target heart rate should be 50 to 70% of his or her maximum heart rate. An estimate of a person’s maximum age-related heart rate can be obtained by subtracting the person’s age from 220. For example, for a 50-year-old person, the estimated maximum age-related heart rate would be calculated as 220 – 50 years = 170 beats per minute (bpm). Thus, moderate-intensity physical activity for a 50-year-old person will require that the heart rate remains between 85 and 119 bpm during physical activity. For vigorous-intensity physical activity, a person’s target heart rate should be 70 to 85% of his or her maximum heart rate. To calculate this range, follow the same formula as used above, Thus, vigorous-intensity physical activity for a 35-year-old person will require that the heart rate remains between 130 and 157 bpm during physical activity. To determine whether you are exercising within the heart rate target zone, you have to be monitoring your heart rate. You can do this two ways. The easiest is to invest in a heart rate monitor. This unit consists of a strap that you place around your mid-section, and a wrist watch. The two communicate with one another and your heart rate is displayed on the wristband. This is by far the most convenient and accurate way to monitor your heart rate. The second way is to measure your pulse the old fashioned way, which requires you to stop exercising briefly to take your pulse. You can take the pulse at the neck, the wrist, or the chest. Most professionals recommend the wrist. You can feel the radial pulse on the artery of the wrist in line with the thumb. Place the tips of the index and middle fingers over the artery and press lightly. Do not use the thumb. Take a full 60-second count of the heartbeats, or take for 30 seconds and multiply by 2. Start the count on a beat, which is counted as “zero.” If this number falls between 85 and 119 bpm in the case of the 50-year-old person, he or she is active within the target range for moderate-intensity activity.